On January 19, 2015, RASC hosted a star party at Glen Major Forest, and since it would be my last chance at imaging the comet before starting my new job, I decided to take advantage of the party and go there. My goal at that party would be to image the comet with its tail. When I arrived, there were many people already there. There were new members, and veteran members. More people would’ve come, but seeing as it was very cold, it was understandable. After saying hi to everyone, and looking at the comet through a friend of mine’s binoculars, I quickly set up my telescope, and aligned it to Betelgeuse and Polaris, with the help of one of my friends. After asking the host to show me where the comet is, I tried finding it with my telescope. After a lot of help from my friends, I eventually found it, and set my telescope to take multiple one minute exposures. The result were very shaky, but there were a few photos that turned out well. While the camera was capturing the photos, I went around and saw what everyone else was doing. They were all looking at very cool celestial objects. However, there were bright lights that came during the night from the North-East. It was troubling. My friends told us that it was from a nearby ski resort. Hopefully, the lights don’t ruin any future RASC events at Glen Major forest. Soon enough, the clouds came in, and we all packed up. I was the second-last to leave, while the host left the last. It was a successful night. I was able to get a good image of the comet, but I didn’t get the tail like I wanted to. This would probably be my last chance at imaging the comet. The next day was predicted to be clear, but I have to get up early the day after for work. Thankfully, I do not let that day go to waste. See the next blog post. Keep Looking Up. There is always something up there. On January 10, 2015, New Eyes Old Skies hosted an event at the Cold Creek Conservation Park. DDO Defenders astronomers and Ian Shelton and Tuba Koktay, in a heated building, presented to all the participants an overview of what to expect in the night sky during the month of January, and it was interesting. This month featured a visible Jupiter moving up the night sky; Venus, and Mercury coming close to each other; and a bright comet called Comet Lovejoy flying through the sky, getting better and better until the Moon comes back. The presentation successfully piqued the interest of many participants. Before I arrived at Cold Creek Conservation Park, I drove up a hill in Markham where all of Markham was visible. 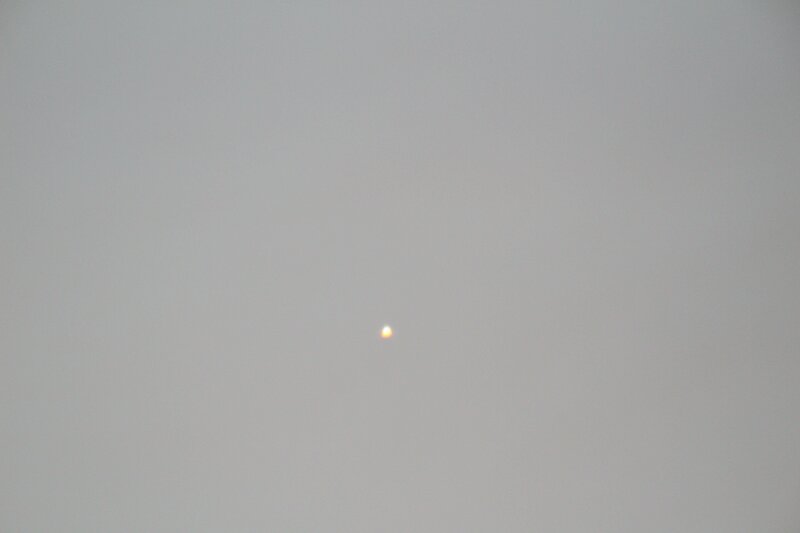 There, I was able to image Venus and Mercury, although not in the same frame. Coming into the park, it was completely overcast. By the end of Ian’s presentation, the sky cleared up enough to reveal the night sky. There were a few scattered clouds in the sky, but they quickly moved out of our way. Since the temperature was -9 C, I had to set up and image very quickly lest the telescope freezes again. 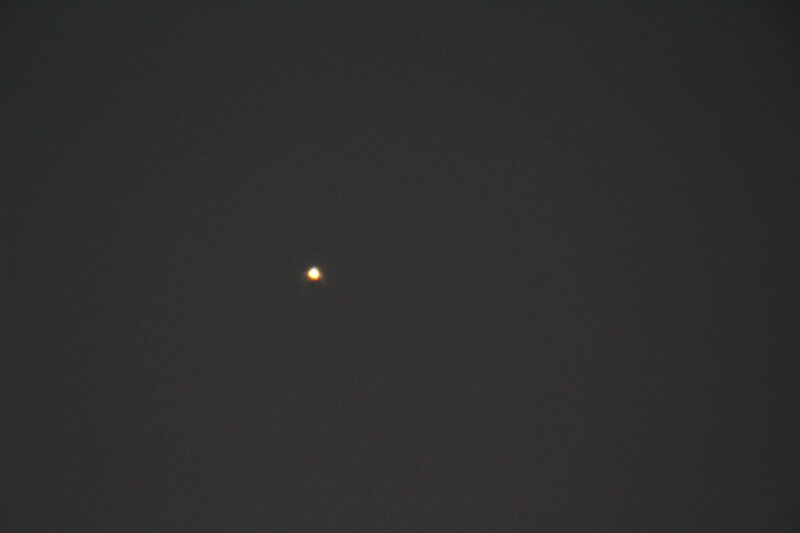 Taking what I learned from my previous astronomy session in Glen Major Forest, I aligned my telescope to Betelgeuse and Polaris using the Two Star Alignment method. When it was ready, I let everyone know inside, and many came out to see me image the night sky. 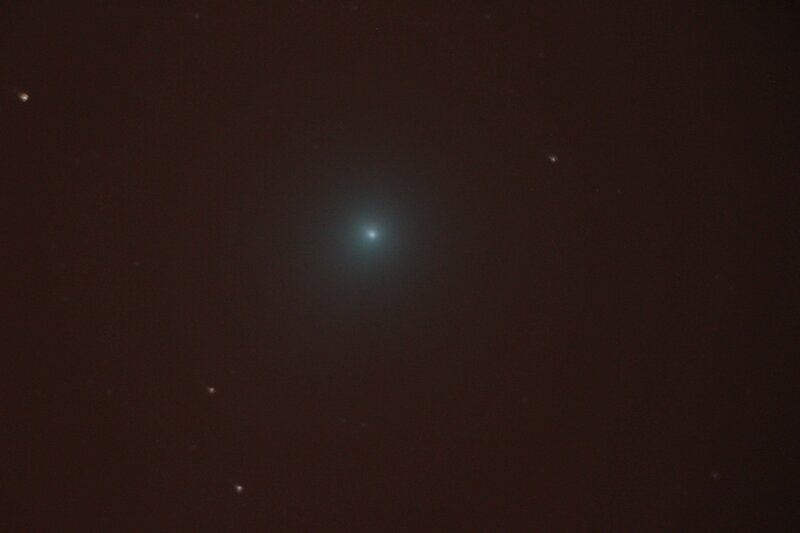 That night, I got lucky with good images of Comet Lovejoy. 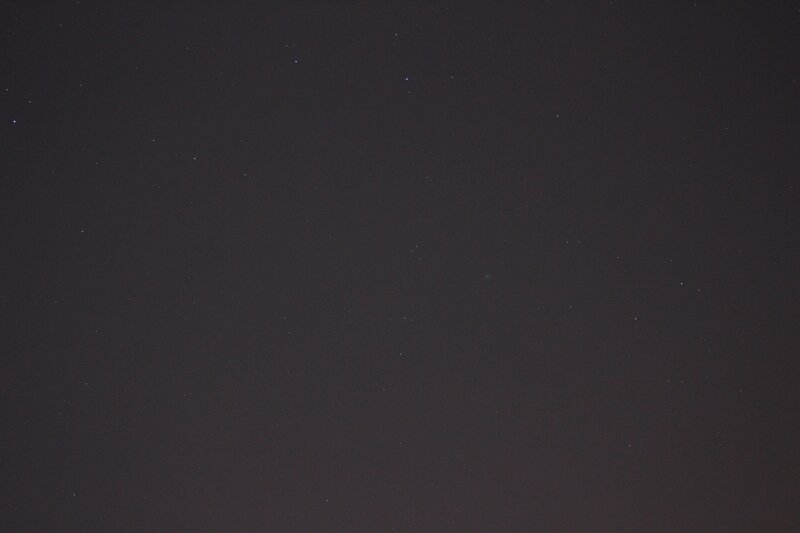 Comet Lovejoy: 255mm focal length: 30″ exposure, f/5.6, and ISO 1600. I wanted to find the comet using my telescope, but my battery was low on energy and finally died. Disappointed, but satisfied with my work, I packed up my scope and made my way home. It was a successful night. I got the chance to image the comet again, and get better pictures. I didn’t get the tail like I wanted, but I guess there is always next time. Thank You for reading everyone. I hope you are all enjoying these stories. I wanted to mention that the presenters, Ian and Tuba offer a number of classes for the general public, most notably their “Introduction to Astrophotography” class. The courses are full of useful information, and are very well presented. I have taken these courses, and I learned a lot from them. I recommended them to everyone interested in astrophotography. The link is here. They also have a lecture series called, ‘Search for Extraterrestrials: Life Originating Elsewhere in the Universe.’ The link is here. Keep looking up! You never know what you will find up there. This new year gifted us with many great opportunities to see something truly unique. It’s called C/2014 Q2, also known as, Comet Lovejoy. Comet Lovejoy was first discovered by Terry Lovejoy in Australia in August 2014. Ever since that time, it has brightened significantly, and has now crossed the celestial equator becoming visible for the Northern Hemisphere. Since the start of the new year, I’ve been trying to image the comet. The next few posts will chronicle my attempts to image the comet. On January 6, 2015, I started my journey on my front yard, freezing myself in sub-zero temperatures. I opted to use my tripod instead of my telescope. 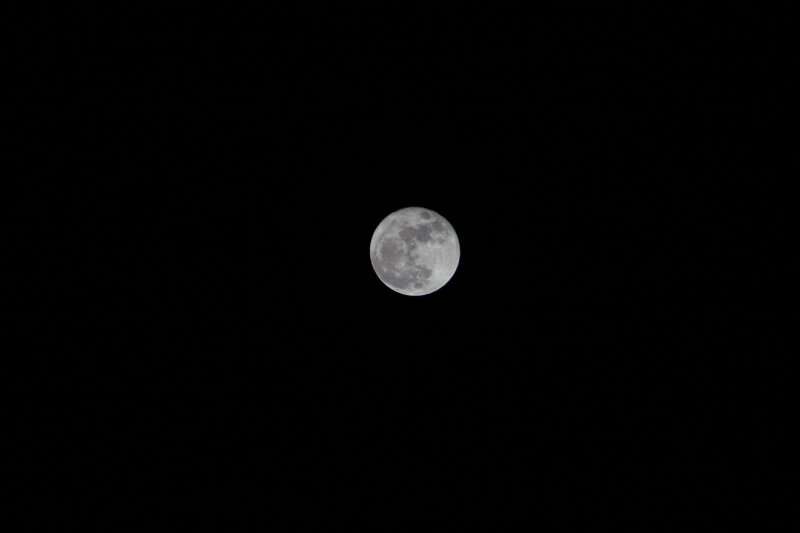 I started taking pictures of the full moon. It was magnificent! 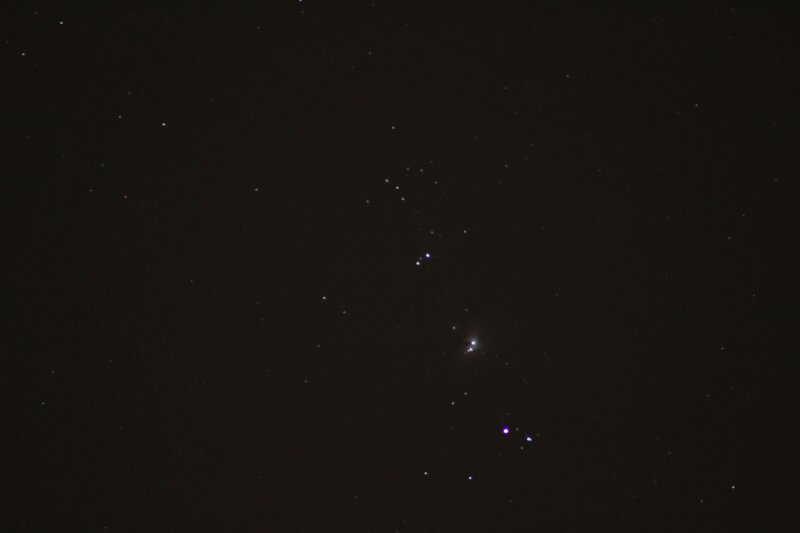 After capturing a number of good images, I went on to image the Orion Nebula. That took more effort, but it was all for naught, as my images were not focused enough. It was heartbreaking but there was no point sulking on it. I then decided to try my hand at imaging the comet, and I was dealt a good hand. 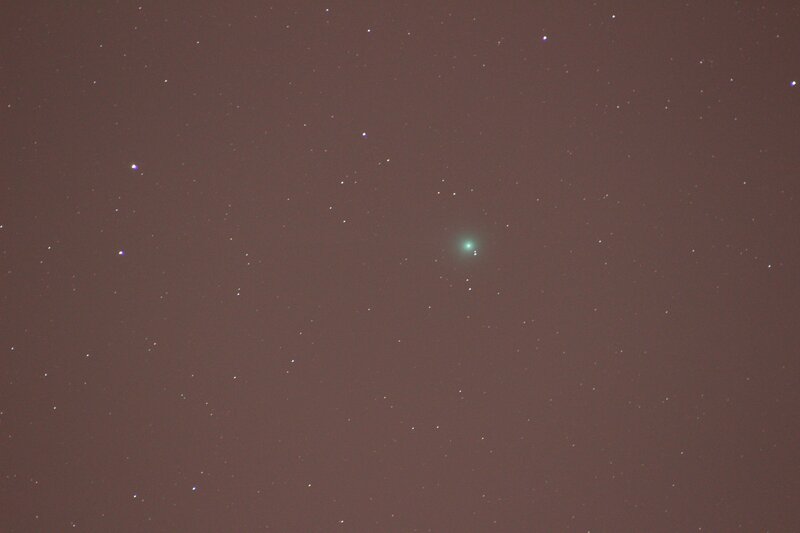 Using my father’s telephoto lens, I was able to image the comet near Orion. I took a number of two second exposures of the image, adjusting the image to get the comet at the center of the frame each time until it was just right. I was able to stack them together to reduce the noise. 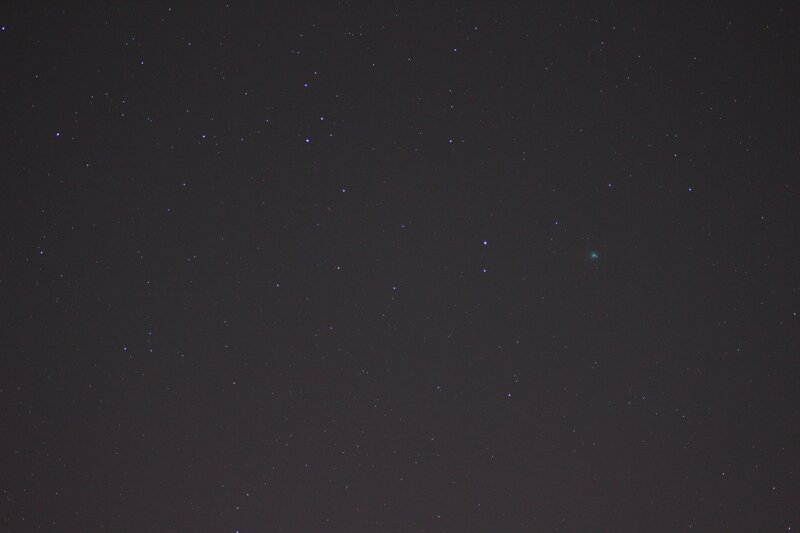 The final image was dim, but I have, indeed, caught a comet. 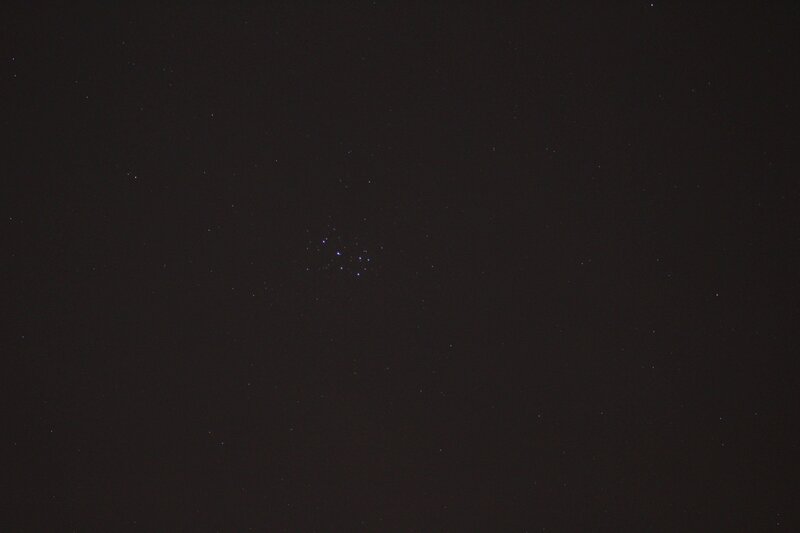 My camera’s memory was filling up, and I decided to end the session with a few images of the Pleiades. Those were one of the best images I had captured that night. The seven sisters were shining beautifully that night with all their grace. That night was a successful night. I was able to image many celestial objects. It served as the start of my journey to image the comet, and other Deep Sky Objects. I continued my journey in the next few days. On November 12, 2014, the European Space Agency (ESA) will deploy the Phillae lander from the Rosetta probe to land on comet 67P/Churyumov-Gerasimenko. This is a historic moment in space travel, because this represents the first time humans will have direct access to a comet’s material to study, and learn about the origins of our solar system, provided that everyone goes as planned. For those who don’t know, Rosetta is a probe that was launched by the ESA on 2004. To get to its destination, it had to do many planetary gravity assist maneuvers, or swing-by’s, including a risky Mars swing-by nicknamed the “Billion Euro Gamble.” Along that time, it was mistaken to be an asteroid and observed two asteroids called 2867 Šteins, and 21 Lutetia. It was then put into hibernation for the rest of its journey to the comet. The comet as seen by Rosetta from August 1-6. Rosetta started it’s deceleration maneuvers by moving itself in two triangular paths, each closer, to the comet surface, than the previous one. After descending to 30 km, on September 10, it entered into an orbit around the comet. After reaching orbit, it began mapping the comet’s surface to find possible landing sites for Phillae. It found many landing sites, but the ESA eventually chose landing site J, now known as Aghika, to land Phillae on. Today, at 9:03 GMT (4:03 am EST) Phillae will separate from Rosetta and seven hours later at 16:02 pm GMT (11:02 am EST), it will land. To see the mission so far, and what the future of the mission is, you can watch this video. In the short film, Ambition, the master tells his apprentice a story about the Rosetta Mission: “So many things could have gone wrong. A failure at launch, an error in the calculations, collisions, so many unknowns.” Thankfully, nothing went wrong, and today, Rosetta is at the comet. Hopefully, it will succeed in its next milestone, and Phillae will give us access to the secrets of the early solar system. Godspeed! UPDATE: It’s confirmed that the Phillae lander successfully landed on 67P/Churyumov–Gerasimenko.